The origins of Japan are recorded in two ancient texts, the Kojiki and Nihonshoki. According to these texts, the ancestor of the emperors, Amaterasu Omikami, sent her grandson, Ninigi no Mikoto, from the heavenly realm down to earth. Ever since, the descendants of Amaterasu Omikami have ascended the Imperial Throne from generation to generation, ruling Japan and venerating their divine ancestor. They also brought prosperity to the land by cultivating the rice they received from her. Each imperial succession involves many ancient rituals, which bring back to life the age of the kami (Shinto deities) in the present. 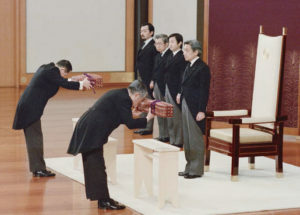 The ceremonies themselves have changed over the centuries, but the rites by which the imperial status is passed on, with the Daijosai rite at their heart, continue to represent the spirit of Japan in the modern age. *The names of the ceremonies are based on those used for the accession of His Majesty the Emperor Akihito. Only the most important ceremonies are listed, and they are not listed in the order in which they occur. With the beginning of the reign of a new emperor, the era name is also changed. In the past, era names were changed for many reasons other than the accession of an emperor, but since reforms under Emperor Meiji in 1868 the change has come to mark a new imperial reign. Thus, the era name symbolises the reign of that period’s emperor. 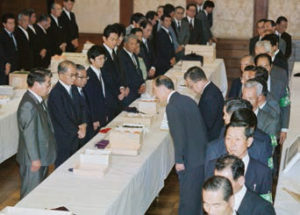 The customs for selecting the era names are that they are written with two characters that express a positive meaning, and that they are chosen to accord with the ideals of the people of Japan. 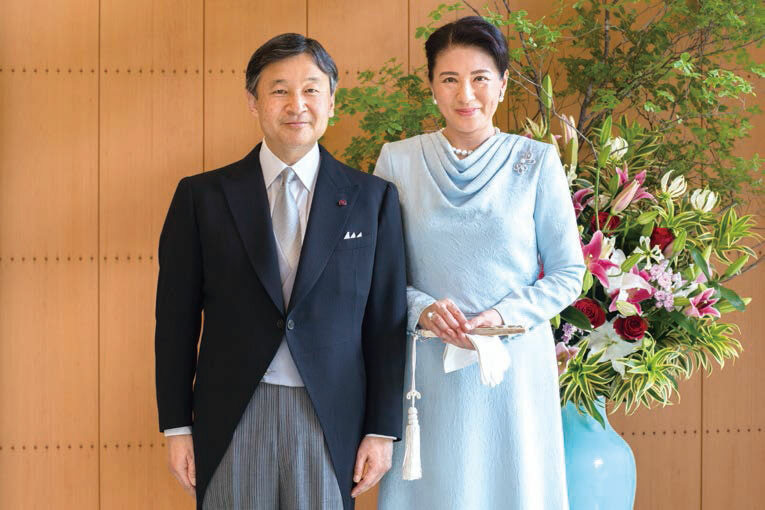 It has been decided that His Majesty the Emperor Akihito will abdicate in favour of his son, His Imperial Highness the Crown Prince Naruhito, on 30th April 2019. This ceremony is known as Jo-i, and will be held for the first time since Emperor Kokaku abdicated in favour of Emperor Ninko in 1817. 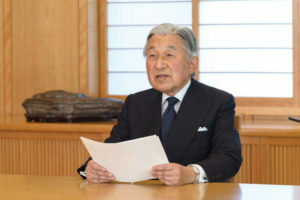 Before his abdication, His Majesty the Emperor Akihito will make one final appearance before the people of Japan in a ceremony to publicly mark his relinquishing of the role of emperor. This ceremony will be held within the Imperial Palace on the day of his abdication, 30th April 2019. The succession of an emperor is called "senso" in Japanese. The throne must not be vacant for even a single day. On accession, the emperor takes control of the Privy Seal of Japan (gyoji), and the State Seal of Japan (kokuji). He also inherits the Three Sacred Treasures and other regalia of the imperial line. The Three Sacred Treasures are the mirror, the sword, and the jewel. These have been passed down through generations of emperors as symbols of the imperial dignity. As the new emperor is inheriting the Imperial Regalia, his ascension to the throne is announced in the three Imperial Palace Sanctuaries: to Amaterasu Omikami in the Kashikodokoro, to the preceding generations of Emperors and the Imperial Family in the Koreiden, and to all the kami of heaven and earth in the Shinden. 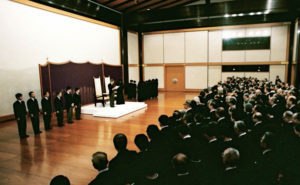 Following the formal accession announcement in the Imperial Palace Sanctuaries, the Sokuigo Choken no Gi ceremony is conducted in the Imperial Palace. The emperor summons the Prime Minister, the heads of the legislature and judiciary, representatives of regional governments, and others to announce his accession as emperor. "Senso" originally refers to the fact that the emperor has become emperor: to his accession. The ceremony by which the new emperor later announces that fact to Japan and the world was called "sokui", or enthronement. However, as "senso" currently has no legal definition, the two are not distinguished, and everything involved in the accession of His Majesty the Emperor Akihito was called "sokui". 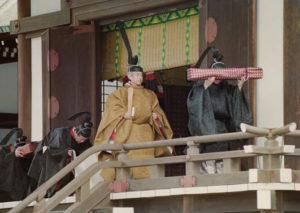 When the dates for the Sokuirei (enthronement) and the Daijosai, have been formally fixed, the emperor personally reports them to Amaterasu Omikami at the Kashikodokoro in the Imperial Palace. Wearing state robes in a colour that is permitted to the emperor alone, he proceeds to the Kashikodokoro, with the sacred sword and jewel borne with him, and then continues to the Koreiden and Shinden to make the same reports to the Imperial Ancestors and the kami of heaven and earth. 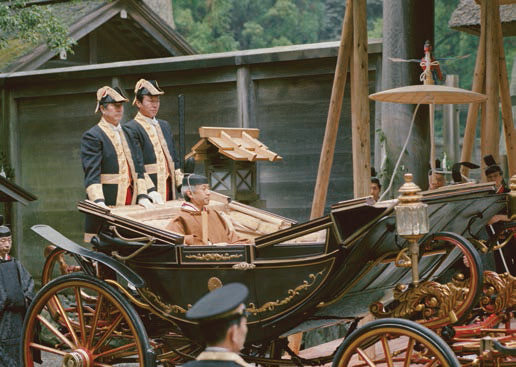 On the day of the Sokuirei, the emperor visits the Kashikodokoro to announce the enthronement ceremony. On this day, the emperor wears pure white court robes, and performs the rites himself. The Sokuirei for Emperor Showa was conducted in Kyoto, requiring the temporary relocation of the Kashikodokoro to Kyoto for this ceremony. At this ceremony, the new emperor proclaims his accession to the people of Japan and to the world. 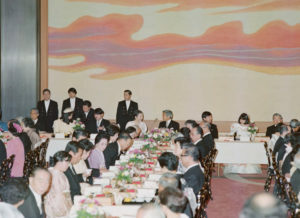 The ceremony is held in the Matsu no Ma (Chamber of Pines) in the main hall of the Imperial Palace. There, the Takamikura throne on which the emperor stands is prepared together with the Michodai, on which the empress stands. 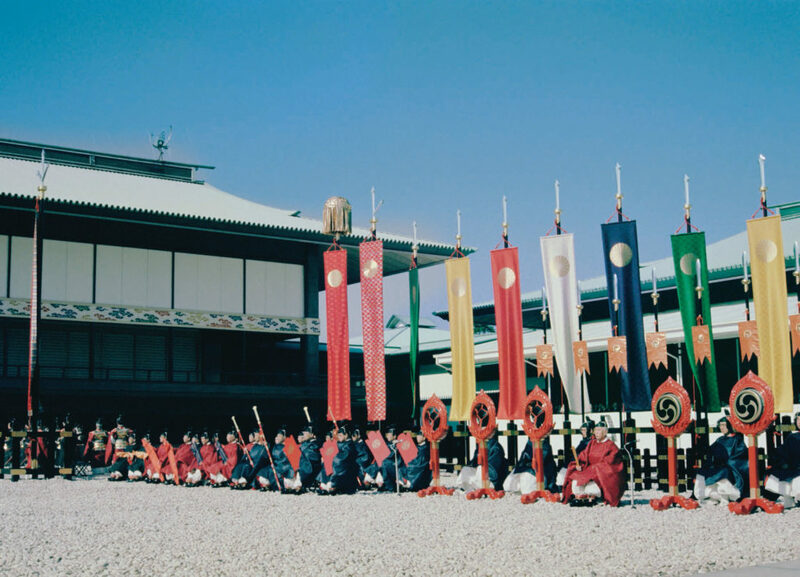 The courtyard is lined with an avenue of brightly coloured flags where attendants dressed in ancient court dress, bearing swords and bows, form ranks to await the emperor. 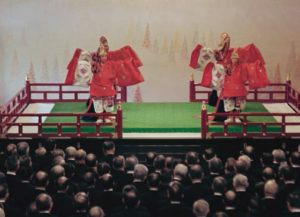 The emperor, wearing his robes of state, ascends to the Takamikura, and makes a statement on the occasion of his accession before the Prime Minister who attends as the representative of the people. In reply, the Prime Minister offers formal words of congratulation and leads the people to call three times for His Majesty’s long life, as the whole nation celebrates the new emperor’s enthronement. After the Sokuirei, the emperor and empress participate in a parade and receive the congratulations and blessings of the Japanese people. 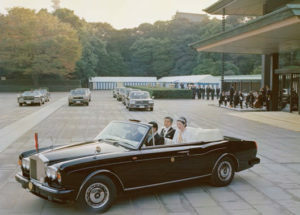 This custom was first introduced at the accession of His Majesty the Emperor Akihito when tens of thousands celebrated his enthronement by lining the streets leading to the Imperial couple’s residence at Akasaka. At this event, the emperor receives the congratulations of foreign heads of state and envoys on his accession. At the enthronement of His Majesty the Emperor Akihito, the event was divided between seven gatherings over four days. 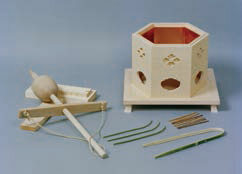 In addition to the celebratory meal and traditional court dances, the Takamikura and Michodai used in the Sokuirei were displayed. 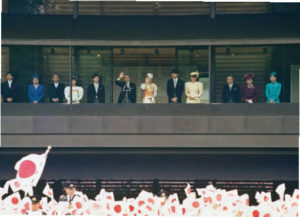 Standing on a veranda of the Imperial Palace, the emperor accepts the congratulations of the people on his accession. At the accession of His Majesty the Emperor Akihito eight such public receptions were held, and over 100,000 people came to offer their congratulations. In response, His Majesty made a statement of gratitude. Every autumn, the emperor conducts the Niinamesai ceremony within the Imperial Palace, in which the year’s harvest is offered to Amaterasu Omikami, the emperor’s ancestor, and to the other kami of heaven and earth. 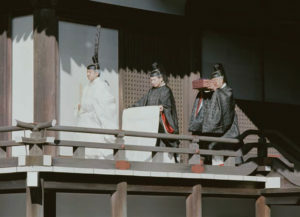 The first Niinamesai ceremony after an emperor’s enthronement is the Daijosai. The Daijosai is performed only once in each emperor’s reign, and it is an essential part of the accession ceremonies, being the most important of all the rituals conducted by the Imperial Household. The Daijosai is conducted in a specially constructed complex of buildings, the Daijokyu, which houses two main halls, the Yukiden and Sukiden, at its heart. 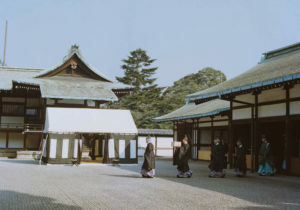 The Daijokyu is unadorned, constructed using ancient techniques, and within it the emperor conducts the ceremonies in person, just as they were performed in the distant past. The Daijosai is celebrated by the entire nation, symbolised by the offering of rice from the sacred saiden rice fields, which represent the entire country. The Kojiki and Nihonshoki record that, in ancient times, Amaterasu Omikami performed ceremonies to offer the rice harvest to the kami. In performing this ceremony, the emperor fulfils a duty that has been borne by his ancestors across history, and brings Amaterasu Omikami’s actions back to life in the present. The rite is an expression of gratitude to Amaterasu Omikami and the other kami for the abundant harvest and for the peace of the nation and its people, and a prayer that they might continue. 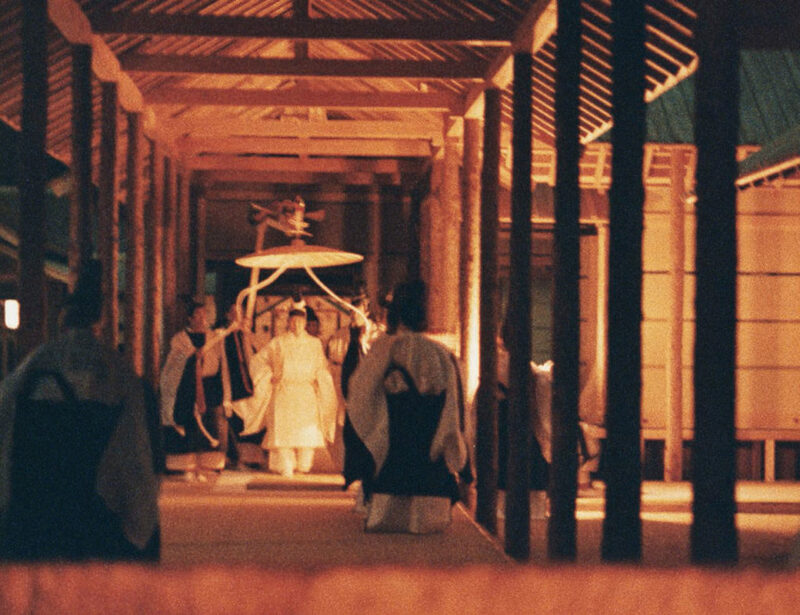 The rituals are performed from evening until the early hours of the morning in the Daijokyu’s Yukiden and Sukiden halls. The emperor prepares for the ceremonies by ritually bathing and is then dressed in pure white ritual vestments. He proceeds to the Yukiden and Sukiden in turn, offers rice and other food offerings to the kami, and recites prayers. After this, the emperor eats some of the sacred food offerings himself. Before the Daijosai is held, two sacred rice fields (saiden) are selected to provide the harvest offerings for the kami. The saiden are established in two places selected from throughout the country and are called the Yukiden and Sukiden. Although these names have the same pronunciation as the names of the halls in the Daijokyu, the "den” here refers to a rice field, not a hall. 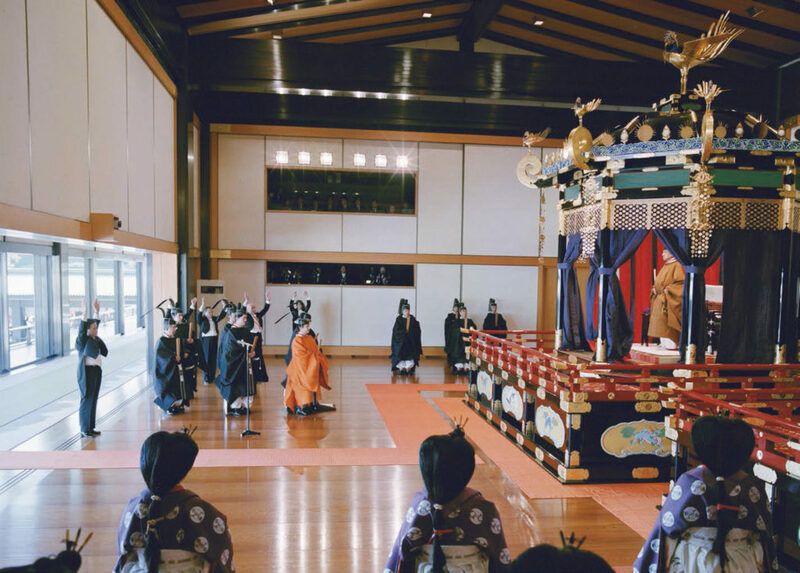 For the Saiden Tentei no Gi ceremony, an ancient form of divination called "kiboku” is performed in the Imperial Palace. 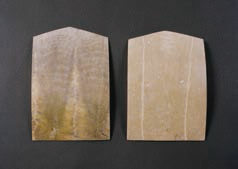 A turtle shell is heated, and the will of the kami is determined from the way in which cracks appear in the shell. Based on this, one prefecture is chosen as the Yuki Region and another as the Suki Region. The specific sites of the Yukiden and Sukiden fields are then chosen from within these regions. The owners of the saiden (otanushi) take on the important responsibilities of raising, harvesting, and presenting the rice on behalf of the nation. Tortoise shell divination, in which a turtle shell is heated and good or ill fortune is determined from the pattern of cracks that appear, has a long history with excavated relics dating back to the fifth century. 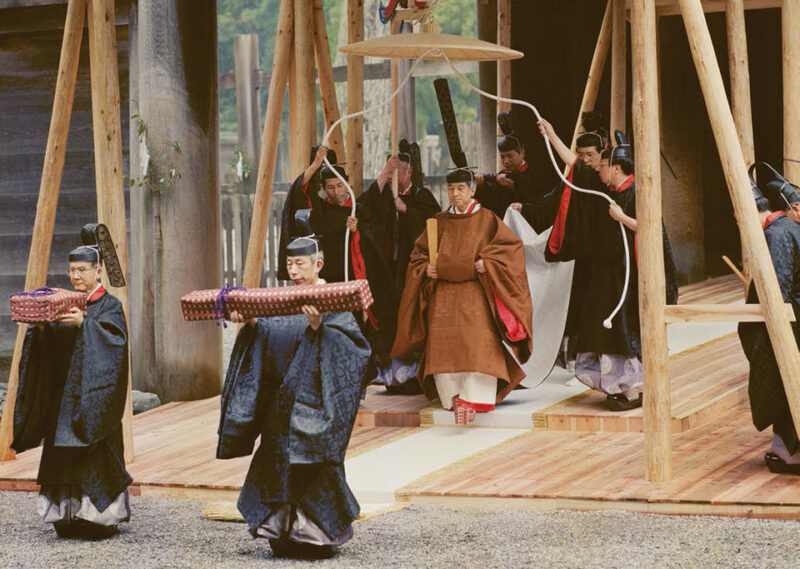 Around a thousand years ago it was performed whenever the Imperial Court faced a crisis, but it went into decline about eight hundred years ago, and is now said to be only performed on the island of Tsushima, in western Japan. When autumn comes and the rice ripens at both the Yukiden and Sukiden, the Saiden Nukiho no Gi ceremony is performed. This important ritual includes the harvesting of the rice that the emperor will personally offer to Amaterasu Omikami. 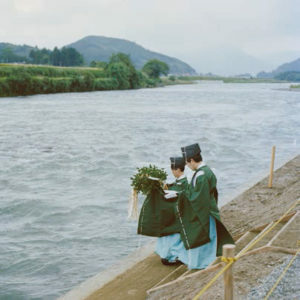 In advance of the ceremony, a ground-breaking ritual is performed to purify and bless the ground, and the ceremonial site, or saijo, is made ready, The day before the ceremony, a ritual is performed on the banks of a clear river near the saiden to purify everyone involved. On the day itself, offerings of food and cloth are made at the saijo, and after the emperor’s envoy offers a prayer, the otanushi perform the Nukiho rite in accordance with ancient practice. After the rites, the rice is harvested, and carefully selected heads are threshed and submitted as the offerings for the Daijosai. The staple food of the Japanese is rice, and Japan has a long history of rice cultivation, with its origins recorded in legend. Amaterasu Omikami gave her grandson Ninigi no Mikoto rice from her sacred field, to serve as food for the people. Through the Daijosai, we can see that this history of rice agriculture, rooted in ancient legend, still flourishes today. Ceremonies in Japan customarily finish with a meal of celebration (naorai). The Daikyo is the Daijosai’s naorai, and is held over the course of two days starting the day after the Daijosai. The offerings made to the kami during the Daijosai are shared with the representatives of the Japanese people who attend the banquet. By sharing the same offerings, the emperor and the people make the bond between them still stronger. 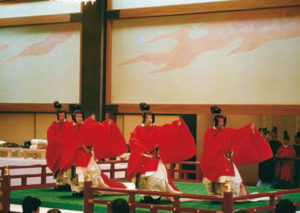 At the Daikyo no Gi, the accession of the new emperor is celebrated in grand style with the performance of traditional dance. When the new emperor has completed the Sokuirei and the Daijosai, the emperor and empress officially visit Ise Jingu, the most sacred site in Shinto, to report this in person to Amaterasu Omikami. Accompanied by the sacred sword and jewel, they pay their respects first at the Outer Sanctuary, or Geku, and then at the Inner Sanctuary, or Naiku. After paying their respects at Jingu, they visit the mausoleum of the first emperor, Emperor Jinmu, and recent emperors to report that the rituals of accession have been safely completed. 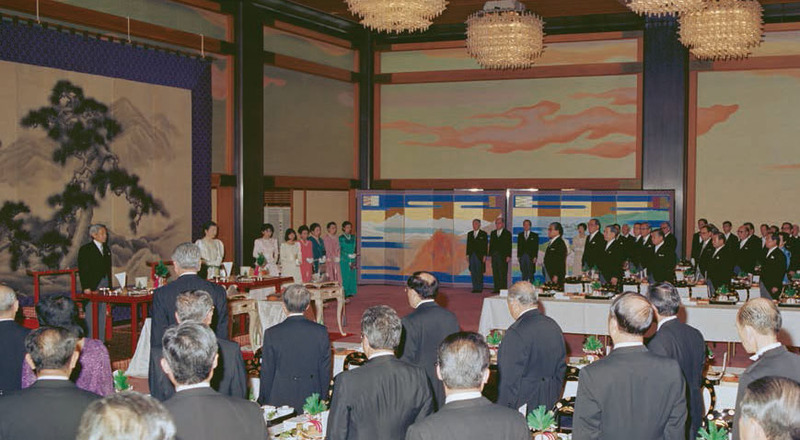 At the last accession, His Majesty the Emperor Akihito wore his robes of state, while Her Majesty the Empress Michiko wore traditional court dress. 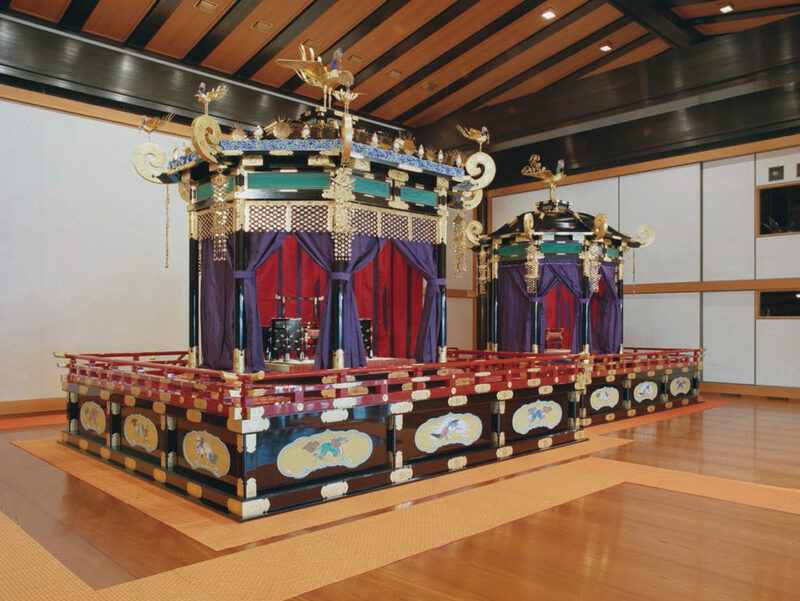 The Takamikura has been used as the throne of the emperor at important court rituals for over 1200 years. The current Takamikura was made for the accession of Emperor Taisho in 1915, and was used for the accessions of Emperor Showa and His Majesty the Emperor Akihito. The seat of the empress is called the Michodai. The Takamikura and Michodai are normally kept in the Shishinden hall of the Imperial Palace in Kyoto. For the accession of His Majesty the Emperor Akihito, they were both brought from Kyoto to the Imperial Palace in Tokyo. The Takamikura has a square base, upon which sits an octagonal platform. From the corners of this platform, pillars rise to support a roof. At the peak of the roof is a large phoenix, while small phoenixes stand at each of the eight corners. As the throne used at the accession of the emperor, it has been prepared in accordance with ancient tradition. 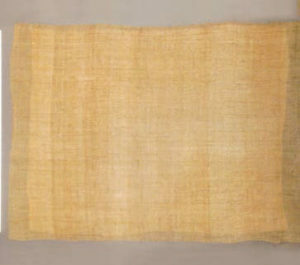 In addition to rice and other food, the offerings at the Daijosai also include clothing for the kami, nigitae (soft silk) and aratae (rough linen). 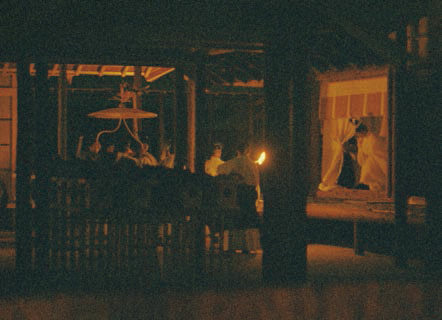 The Nihonshoki describes Amaterasu Omikami weaving clothes for the kami as part of the rites of the Niinamesai ceremony, showing that weaving has long been culturally important in the same way as the cultivation of rice in the saiden. The nigitae and aratae were traditionally prepared in regions of Aichi Prefecture and Tokushima Prefecture respectively, and for the accession of His Majesty the Emperor Akihito they were made and submitted in accordance with historical records and traditions. The offerings at the Daijosai are not limited to the rice presented from the saiden in the Yuki and Suki Regions. Regions throughout Japan also offer their special agricultural and marine products as Niwazumi no Tsukueshiromono. They are so called because they are offered on tables (tsukue) in the Niwazumi no Choden halls in the courts to the south of the Yukiden and Sukiden. This custom began with the Daijosai of Emperor Meiji in 1871. The ceremony made an exceptionally deep impression on me. Asia can take pride in such a re-enactment of a traditional ceremony. It is in some ways astonishing that such an ancient rite has been preserved, and performed in a way fitted to the present, in this, the most economically advanced of countries. We were awed by the superb order of the ceremony. Carried out in accordance with traditions passed down from Japanese antiquity, the ceremony was sublime in its simplicity; a marvellous event that left a deep impression. It was a beautiful, dignified, and wonderful ceremony. We were struck by the way the atmosphere, the movement of the people, and even the fluttering of the flags were in harmony. The extremely good order of the ceremony made a strong impression on me. Japan may be the only country that can do things with this degree of orderliness. The highly impressive and traditional ceremony left a strong memory. It was astonishing how smoothly the event was carried out considering its size and the number of VIPs in attendance. The Sokui Rei Shoden no Gi left a deep impression in its nobility and dignity. I was greatly struck by Japan’s respect for its traditions. The incorporation of such a traditional and religious ceremony into the ultramodern technological society of Japan is astonishing, and a mystery. As the representative of a small nation, I had feared, before leaving my country, that from the point of view of the great country of Japan I might have been treated casually or even ignored. On the contrary, from my landing on the 10th to my departure on the 15th, I was deeply moved by the great courtesy and consideration with which I was treated in every respect. It was very moving. The ceremony was accessible and simple, but sublime. It was an extremely orderly ceremony, in line with the ethnic traditions of Japan. It was a wonderful ceremony. The harmonious sounds of bells and drums punctuated the silence of the ceremony and made a deep impression on me. Furthermore, birds could be heard singing in the quietude, and it seemed to me that they were also participating. Blessed with the bluest of skies, we could truly call this colour "Imperial Blue”. The Imperial Palace and Akasaka Residence are dignified and beautiful in their simplicity, and the warm reception that the people accorded the Imperial family left a deep impression on me. In its sublime splendour, the ceremony was yet filled with human feeling, and expressed both Japan’s honourable history and traditions and its current power and international position. Furthermore, I was amazed by the almost computerised precision with which the various events were conducted. The love and respect that the people of Japan hold for the Emperor was obvious in the expressions of those who lined the roads to welcome the foreign envoys. It was clear that the Imperial family was open to the people, and that the hearts of the people of Japan were open to the world. It was a wonderful event, well-organised and incorporating many traditional elements. Such ceremonies could only have been held in Japan. The quiet dignity and elegant simplicity of the ceremony made a strong impression. In particular, the extreme simplicity of everything from the architecture of the palace to the robes of the Emperor and Empress, and the very ceremony itself, captured the spirit of Japan. The enthronement ceremony was rich in tradition and dignity, and made a strong impression on me. The role of the Imperial family, which has passed down its heritage in an unbroken line from the distant past, is worthy of the deepest respect. Furthermore, I felt that we have much to learn from the success of the Japanese people in preserving their traditions alongside their modern development. The ceremony itself was both a crystallisation of over 2,000 years of Japanese culture and history, and an expression of the fundamental strength undergirding Japan’s current progress at the forefront of modernisation. If I were to pick out one particular thing, every dish served at the dinners hosted in the Imperial Palace and by the Prime Minister was a work of art. I was greatly struck by just how much Their Majesties the Emperor and Empress are loved by the people of Japan. Furthermore, I was moved to see the depth of culture and tradition behind the economic development of Japan. It is astonishing to see traditions preserved continuously since the middle ages still living at the heart of a Japan that has not only achieved high technological development, but has also thoroughly modernised in every respect. At the same time, I feel that I have glimpsed the foundation of Japan’s achievements. It seems some newspapers said that too much money was spent on the ceremony, but, as it has been more than sixty years since the last accession, I believe it was worth it. I really feel that today I am participating in history. Surely it is worth spending money to create history peacefully? The rites of imperial accession are weighty rituals of which Japan can be proud, performed together by the Imperial Family and the nation, and unparalleled in the world. Through them, the people of Japan once again feel their bond with His Majesty the Emperor all the more strongly. This booklet has described the rituals based on the accession of His Majesty the Emperor Akihito. With his abdication and the accession of the new emperor it has been decided to conduct these rituals in accordance with historical precedent. While looking back on the accession of His Majesty the Emperor Akihito and remembering his service to the country, we, the people of Japan, will, with one voice, celebrate the accession of our new emperor.